If you live in Guatemala you know that corn tortillas are fundamental to Guatemalan eating. They are served with virtually every meal. This practice has a very long history, at least 3,500 years, and is based in Mayan mythology. According to the Mayan creation myth, when the gods decided to create man they tried various materials such as wood and clay but none of these worked out well. But when they used corn to make man it was successful. Mayans are thus "men of corn" both in myth and in practice. Corn is revered and is so fundamental to eating that one can eat as much of whatever foods one wishes but if there is no corn in the meal then it is not a meal. One has literally not eaten a meal unless corn is included. In fact the word for tortilla (qua) and the word for eat (quac) are almost the same. The process begins with corn, but not the sweet corn that most people in the U.S. and Europe are familiar with. The difference is not in the type of corn but when and how the corn is harvested and how it's prepared. Sweet corn is harvested when the kernels are tender and sweet, and can be cooked and eaten straight off the cob. Guatemalans eat corn this way too and it's called "elote", usually eaten with mayonnaise or ketchup. But the vast majority of corn grown in Guatemala is used to make corn masa (dough) for tortillas and tamales. The corn is left on the plant for much longer until the kernels are fully mature and dry. In the U.S., corn that is allowed to mature like this is called hominy or grits but there is a significant difference in how the corn is subsequently processed in Guatemala. To make corn masa (dough) the hardened corn kernels are boiled in water into which an alkali has been dissolved. The alkali used in Guatemala is called "cal" which is calcium hydroxide (lime). U.S.-style hominy and grits are made by using sodium hydroxide (lye). The earliest known use of this process was 3,500 years ago by the Olmec culture (predecessor of the Mayan) and the resulting masa is called nixtamal (pronounced neesh-tamal). Nixtamal is also the correct word used in food science to describe corn that has been treated in this way: nixtamalized corn. Nixtamalization does several things to the corn. It softens the husk, releases the germ, and it increases the nutritional value of the corn by releasing and converting nutrients such as niacin, B vitamins, and amino acids into a form more easily absorbed by the human body. The "cal" also adds calcium which helps to balance out the excess of phosphorus contained in corn. After boiling the kernels are fairly easy to grind into a sort of wet dough that is then used to make tortillas and tamales. The corn is usually cooked in a large metal basin the size of a washtub over an open fire. Sometimes an actual washtub is used but there is a proper device for cooking nixtamal that looks something like a huge wok but deeper and three feet in diameter. The mix is heated to boiling over an open fire and left to cook until the kernels are soft. Then the excess water is poured off and the cooked corn is ground. This used to be done by hand with a stone grinder but today it's usually done by machine. A few people have their own grinder but most use a communal grinder. Every village and neighborhood has an electric or diesel powered corn grinder. The cooked corn is loaded into the machine and corn masa comes out the bottom, ready to use. Around midday it's common to see women walking down the street balancing on their heads a plastic basin covered with a cloth. They are on their way to or from the local corn grinder. The masa is then used directly to make tortillas or tamales. A tortilla maker wets her hands, grabs a handful of masa, and with well practiced skill rapidly pats and slaps the masa between her palms to form a perfectly round tortilla of even thickness. The tortilla is then placed on a comal to cook and turned over once or twice during the process. The tortilla maker slaps out tortillas one after another and usually has six or eight cooking on the comal at once like a production line. A comal is the traditional stove here in Guatemala. It's reminiscent of a brick barbecue with a sheet of heavy steel or iron instead of a grill. 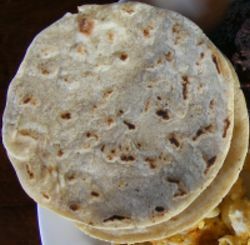 A typical comal has a cooking surface about three feet square and is heated with firewood (leña) which gives the tortillas a faintly smoky taste. The steel cooking surface is used to cook tortillas directly. Pots can also be placed directly on the comal to boil. Nowadays if one is in search of a genuine Guatemalan tortilla one must be careful to find those that are made with traditional materials. There are mass produced powdered mixes available today that are often used in restaurants that don't want to bother with making tortillas from scratch. What's more, with the recent rise in the price of corn and firewood it has become more economical for average families to use the powdered mix than to make tortillas from scratch. It takes a lot of firewood to cook the nixtamal and firewood has become more costly and difficult to obtain. But be aware that the flavor of a tortilla made from masa mix and the flavor and aroma of a tortilla made from scratch are very different. The consistency is also different. A tortilla made from scratch is fluffier and more cake-like and has a different taste and smell. Before forming an opinion about Guatemalan tortillas be absolutely certain that you have tried traditional scratch-made tortillas. I can tell the difference just by smelling them so it's not a small difference. In Guatemala a meal is not a meal without a tortilla. Tortillas go with just about everything. Tortillas can replace fork and spoon. With practice one can learn to eat an entire meal using the tortillas as utensils. One can even eat a bowl of soup with tortillas instead of a spoon. Please do give them a try and we hope you like this most fundamental food of Guatemala.